Recycle - Where does a circle begin? Nature depends on recycling for survival. Living and nonliving matter in time go back to elemental parts. And, the circle continues. Repeats. Repeats. Buildup. Breakdown. Repeats. Recycling is reutilizing chemicals and keeping them in the system. 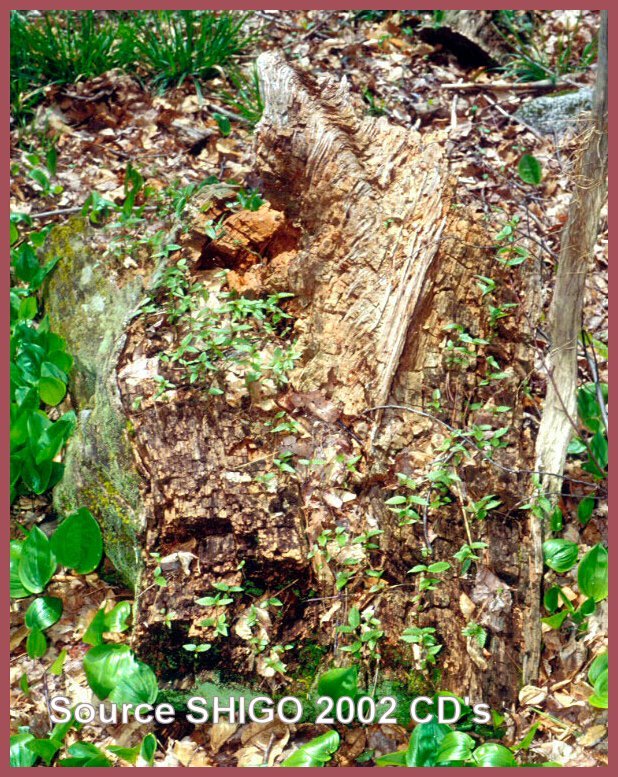 Such as essential elements used and stored in tree trunks are reused throughout the ecological stages of trees by flora and fauna. CWD are essential element recycling centers. Those that use nutrients manufactured by the tree are not recycling, they are using the product of the tree, but they will be recycled. But it does stay in the system. Unless wood is removed by man, not to mention CWD are water reservoirs for plants and animals such as during dryer times, trees have unique functionality throughout their ecological stages. Non-woody roots shed dying and dead root hairs and epidermal cells. The shed cells are digested by soil microorganisms. They recycle elements essential for life. Trees are recycling systems. Humus ends in gases back to be used again.